Vietnam-era veteran Diane Fike selects vegetables at the Austin, Tex. VA food pantry. Studies have found a growing number of veterans are food insecure, including many who fought in Iraq and Afghanistan. More than 1.4 million veterans of all ages rely on government food assistance, but food insecurity is disproportionately common among post 9/11 veterans. Carson Frame reports that food insecurity is becoming more common among some groups of veterans. Even before the sun was up, crowds gathered in the parking lot of the VA Austin Outpatient Clinic for its once-a-month pop-up food bank. A truck from the Central Texas Food Bank idled nearby, as volunteers busily unloaded shipments of fruit, vegetables and meat. Turnout was so high that veterans had to take numbers. Diane Fike, a Vietnam-era Army veteran, came with a cart and some freezer bags. She sat on the curb with her dog Quinn waiting for her turn to pick from a selection of fresh and packaged groceries. "Sometimes they're very generous," Fike said. "I hit the jackpot once; they had a bunch of shelf-stable milk. That was great." Fike prefers food with a long shelf life because she has trouble getting out of her house. Money grew tight after she became disabled, and she doesn't have a vehicle. When she needs transportation, she has to give 24 hours notice. "It's terrible sometimes if you're sick and you miss your ride," she said, recalling times when she had run low on food. On average, about 1.5 million veteran households rely on Supplemental Nutrition Assistance Program benefits each year. Elderly and homeless vets have long been at risk for food insecurity, but younger veterans from the Iraq and Afghanistan wars are increasingly in need, said social worker Kelli Garrett, who leads the Austin VA's mobile food pantry. 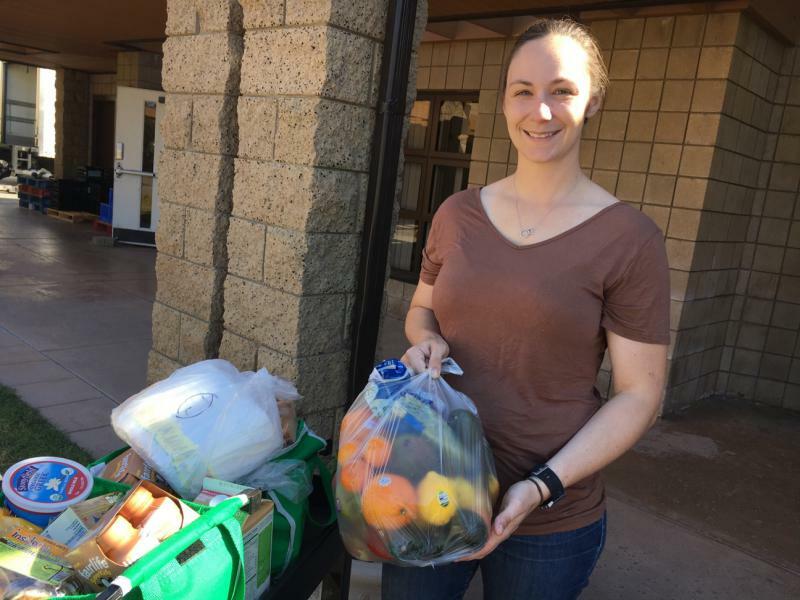 "Here at our food pantry and just in my work in general with the homeless program, it has been noticeable: an increase in the population of veterans under 35 or so," she said. A University of Minnesota survey also found that post-9/11 veterans in that state were struggling to put food on the table. Associate professor Rachel Widome led the survey, which concluded that 27 percent of participants had experienced food insecurity. "That was just so much higher than the prevalence of food insecurity in the general U.S. population, which is usually around 14 or 15 percent," she said. "I thought that it was very shocking and, honestly, quite unconscionable that such a sizable proportion of those who were sent to fight these wars were now struggling to afford food." Food insecure veterans tend to be unmarried, with lower incomes, and in households with children. They often reported binge drinking, tobacco use, and sleeping less. Transitioning out of the military poses unique challenges for the young, Widome said. "Sometimes younger veterans don't have a lot of job experience and don't have as many connections in the civilian world for finding work right away," she said, "and they might not have as much as far as savings goes." Daren Benito, a 45 year-old veteran of the first Gulf War, is just a bit older than the group Widome studied. As a single father of two, Benito wrestled with severe post-traumatic stress disorder after leaving the Army, eventually falling into a period of homelessness. He said he often went hungry to feed his kids. 45 year old Gulf War veteran Daren Benito waits his turn at the Austin, Tex. VA mobile food pantry. A single father, he said he has gone without adequate food to provide for his children. "I had to go days at a time just to make sure that they had a good meal on their plates," he said. Though Benito has since found housing and more stable footing, he still hesitates to accept resources from places like the Austin VA food pantry. "I still feel like a protector," he said. "I still feel like I should be the one taking charge, taking the lead. So oftentimes it's hard to have to yield to better judgment, to come out here and humble yourself to an experience like this, because it just makes you feel kind of down." The Austin food pantry is under the auspices of the Veterans Pantry Pilot Program, a nationwide collaboration between the VA and hunger relief network Feeding America. It has established food pantries at VA medical centers in Ohio, South Carolina, Florida, and other states. The VA directed also all of its medical facilities in October to start screening veterans for food insecurity as part of their routine medical care. Anne Utech, the VA national director for Nutrition and Food Services, said the screening is necessary in part because of stigma. "As you can imagine, this topic can be rather sensitive," Utech said. "People don't like to bring it up. So that's why there's a need for healthcare providers to ask and screen for it." The screening question asks veterans whether they've run out of food, were unable to access more food, or didn't have money to buy food in the past three months. According to Utech, the screening is designed to catch as many positive answers as possible and to account for non-financial factors like physical immobility and lack of transportation. When someone answers yes, that's supposed to trigger intervention by a social worker, a referral to a local food bank, or help in getting federal food assistance. So far, more than 1 million vets have been screened, and the VA is compiling information about who's in need. But if there's one thing everyone is seeing, it's an increase in demand. In both March and April, the Austin VA food pantry served more than 200 households in two hours. Thousands of military households rely on government food assistance programs, but the Pentagon doesn't track how many service members have trouble feeding their families.